Debate Over Bird Flu Research Moratorium Flares Up Again : Shots - Health News Scientists are convening to debate whether experiments that make some viruses more contagious in order to advance understanding of potential outbreaks are worth the risk of creating one. 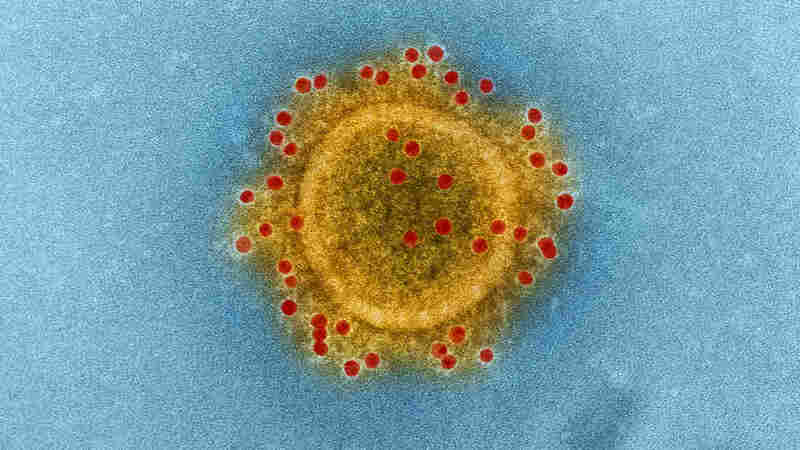 The Middle East respiratory syndrome coronavirus, which causes MERS, is one of the microbes that has sparked research controversy. Former United Nations bioweapons inspector Rocco Casagrande has a Ph.D. in experimental biology from MIT. He's got a rational, science-loving mind, so he's not the kind of guy you'd expect to have a big picture of a tarot card over his office desk. 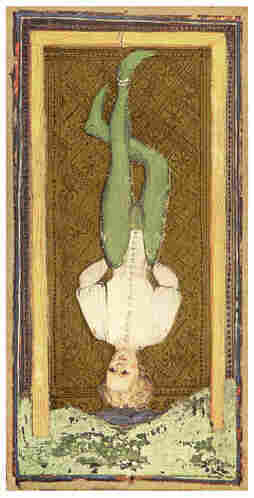 The Hanged Man tarot card, seen here from a 15th century deck, helps explain why a former bioweapons inspector's company was hired to look at the risks and benefits of viral research. "I like what it symbolizes," says Casagrande, hastening to explain he doesn't believe in tarot. He just thinks that this particular card, known as the Hanged Man, illustrates something important for solving problems. "The story is the fool, who is the hanged man, needed to solve some puzzle," says Casagrande. "So he hanged himself upside down from a tree for seven days and figured it out from that change of perspective." Getting a change in perspective is why federal officials recently hired Casagrande to help them grapple with a really tough puzzle. For more than four years, scientists have been arguing over whether to do experiments that could make more dangerous forms of certain viruses — influenza, SARS or MERS — that could potentially start a pandemic in people if those creations got out of the lab. Proponents of the work say that viruses out in nature are mutating all the time, and researchers have to prepare for the threat of another naturally occurring pandemic like the 1918 flu that killed millions. They say they need to understand what these viruses might do. Critics say the work is too dangerous, because a lab-altered virus might escape or fall into the wrong hands and cause a global outbreak. In October 2014, the White House put a moratorium on funding these types of experiments so that officials could think it through. "There are very few examples where the government has ceased funding of research because of safety concerns," Casagrande says. "And that is an extremely momentous decision that was made." When Casagrande saw the government wanted someone to do an independent assessment of the benefits and risks, his company Gryphon Scientific applied for the job. "I knew that this was one of the more important scientific policy questions in the life sciences, probably in my lifetime," he says. He also knew what he was getting into. "We knew it would be contentious. The debate would be passionate. We knew there'd be stark criticisms no matter what we found," Casagrande says. "But we figured the analysis had to be done as rigorously as possible and that we could do it." His team's report is over 1,000 pages long and will be discussed Thursday and Friday at the National Institutes of Health, which is holding a meeting of a government advisory committee called the National Science Advisory Board for Biosecurity. Proponents and critics of this research both say the independent review supports their views — and where it doesn't, they say, it's flawed. Virologist Ron Fouchier, at Erasmus Medical Center in the Netherlands, got U.S. funding to create a modified bird flu that sparked this whole debate back in 2011. He says the report overstates the risk of his work. He says labs like his have enhanced safety features to contain airborne pathogens that weren't considered in this report. "And therefore any risk that is being calculated is off by a few orders of magnitude from what it must be in my opinion," says Fouchier. Still, he liked how the report laid out the potential benefits. If you want the exact opposite opinion, talk to Marc Lipsitch, an epidemiologist at the Harvard School of Public health. He says the report exaggerates the benefits while downplaying the risk that a lab-modified virus might get out and start a pandemic. "Even given their very optimistic assumptions in some cases and erroneous assumptions in other cases, which all lead them to think the risk is smaller than it is, they still come out with a level of risk that is unacceptable," says Lipsitch. He thinks these experiments shouldn't be done at all. "Experiments to manufacture viruses in the lab that may be highly virulent and highly transmissible in humans are extremely risky, and have very little value for improving our response to these viruses, compared to safe alternatives," says Lipsitch. These kinds of responses don't surprise Casagrande. When you try to be impartial, he says, "you expect to be damned by both sides." He says his job was just to gather the best available evidence into a kind of encyclopedia of risks and benefits for genetic experiments with these viruses. "If anyone's worried about any particular manipulation, they can use our report to find out exactly how risky it is, compared to an unmodified strain, and then go to the benefits section and then say, 'OK, what are the benefits of doing that type of work?' And then make their own conclusions," Casagrande explains. It'll be months before government officials come to any conclusions on what kinds of experiments can go ahead. They're waiting to hear the final word from their advisory group, and that won't come until draft recommendations get discussed at a public meeting hosted by the National Academy of Sciences scheduled for March. But in the end, after these years of debate, what U. S. officials decide may not matter much. Scientific research happens all around the world, after all, and not all nations will see things the same way. At Fouchier's lab in the Netherlands, certain experiments that were funded by the U.S. have been halted because of the moratorium. "There are people like me who are very much in favor of this work because we truly believe that this is the only way forward. And then there are people who are thinking the exact opposite," says Fouchier. "I think it's going to be very hard to reach consensus." He says if Americans eventually decide they can't support this work, he'll just find a different source of funding and start back up again.